I love to travel as I am sure most of you do. Often when we travel time is limited so staying well is a priority. You also could be crossing time zones and travelling in planes where the air is circulated for hour upon hour. Filters can only do so much and planes are a breeding ground for infection. This sounds so lovely when all you want to do is enjoy the time away, not so? 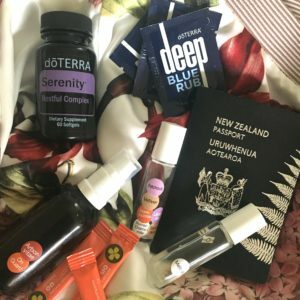 Well help is at hand and there are natural tools to staying well and thriving when travelling! These are the oils and products I take with me when I travel. They are not bulky and easily fit into a small makeup bag or pouch. This is ESSENTIAL for airplane travel. ESSENTIAL. Hope that was clear enough, haha! I spray the head rest/ tray and seat discretely, trying not to look like a lunatic. This is a wonderful spray for your face and rehydrates you AND gives you protection from bugs and infection circulating in the air. On Guard is the Protective Blend and helps to protect against viruses, bacteria, mould and other pathogens. Arborvitae is a powerhouse oil- being anti-fungal, anti-viral and anti-bacterial. Arborvitae is one of the oils in On Guard and I like that by using it in conjunction with On Guard I am boosting the properties of On Guard. I also used this at the hotel and sprayed my pillow with it. You never know and it pays not to think too long and hard about using a hotel pillow. I used 20 drops of On Guard and 10 drops of Arborvitae in a glass bottle and filled the rest of the bottle up with water. Shake before using- super easy. Melissa is an incredible oil for overall health. It has antibacterial, antiviral, nervine, antihistamine, antispasmodic & sedative properties so pretty much a bug fighter in a bottle. The last time I travelled I was speaking at a conference and I needed to stay well. I spoke at the end of the trip so used Melissa constantly. One session I sat next to a lady with a hacking cough and rollered Melissa on my palms and breathed in. When the lady noticed what I was doing I rollered it on her too. Did I appear a bit intense? Maybe… Did I get sick? No! Melissa is a powerful oil and you only need about 7 drops in a 10ml roller ball for it to be effective. Fill the rest of the roller ball with a carrier oil and use liberally. This is a personal one, as I find that most times I get sick, it starts with a sore throat. Tea Tree is a wonderful infection fighter and is incredible for a sore throat. I sprayed this into my mouth to keep my throat protected. You could also the On Guard/ Arborvitae spray instead, but I have found there is nothing like Tea Tree for a sore throat. I used 10 drops of Tea Tree in a small 15ml glass bottle and filled the rest of the bottle up with filtered water. Shake before using. Crossing time zones is a killer for me. I struggle to sleep at the best of times so telling my body it’s time to sleep when it wants to party, is an uphill battle. I make a very strong sleep blend when I travel and it really works for me. I used 7 drops each of Patchouli, Vetiver, Frankincense, Lavender, Roman Chamomile & Sandalwood- all oils with sedative qualities. I slept REALLY well last time I travelled even though the time difference was murderous. Serenity is the Restful blend and I find that combining these soft gels with my sleep blend really did the trick. Do they work on their own? Do I really want to find out? Not really- far better to make SURE you sleep. These are fabulous in a sample size. The toothpaste samples are a single “serving” and so convenient. Far easier than taking a large tube of toothpaste. The Deep Blue (Ice Blue) Rub samples came in handy as I always land up with some part of me a bit achy after sitting for so long. I sat for ages last time I travelled and having Deep Blue rub to use on my lower back was amazing. Using these oils and products will make sure you get to enjoy every moment of being away. Even if it is a business trip with a bit of pressure! I felt safe and empowered with my little stash of goodness. How do you take the sleep blend? Under the tongue, in water?